The IC 20 M VIP design is based on the successful IC 16 M Patrol Boat. 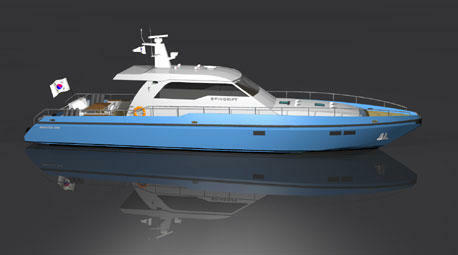 We have produced two luxury “Sports Utility Craft – SUC” to Abu Dhabi owners. The highest Luxury Yacht standards both on deck and below creating a unique combination of a fully professional technical platform with a most sophisticated accommodation; a Sports Utility Craft. The sound insulated wheelhouse midships serves as a good working environment for the crew and the visibility is excellent around the horizon. Accommodation is arranged for the owner in a very luxuries environment. The yacht has large master cabin with a double berth and its own toilet and a separate shower. There is also 2 double cabins for passengers with separate toilets and 1 double crewcabin with a toilet. There is also a large pantry. In the wheelhouse its a large L-shaped sofa that accommodates 5-6 persons. The new IC 20 M VIP, with its extreme speed resources and maneuverability, makes it a most powerful Sports Utility Craft. With a speed capability of 50-55 knots it’s a truly High Speed Craft. It retains the reliability that is the trademarks of all Dockstavarvet designs.